“Modern Warfare” begins like most Community episodes: The gang convenes in the study room. Britta (Gillian Jacobs) and Jeff (Joel McHale) argue through their sexual tension. Pierce (Chevy Chase) makes a culturally inappropriate comment. And Abed (Danny Pudi) compares the situation to a popular television show. 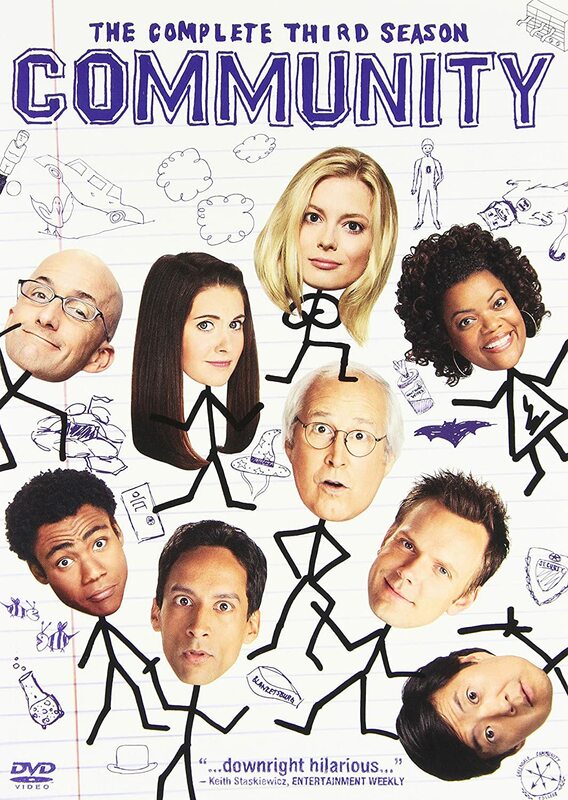 The main plot begins when Dean Pelton (Jim Rash) pops in to enthusiastically promote a school event, a paintball contest, prize “TBD.” Jeff, of course, reacts with irony and detachment, choosing to take an afternoon nap in his car rather than participate. But then, “1 Hour Later,” Jeff wakes to find the campus has become a post-apocalyptic, paintball wasteland. The quad is empty, and multicolored splotches dot every surface. A geek in a daze keeps repeating, “The prize! The prize!” Everyone had formed alliances – temporary and fleeting – and only the most cunning will survive. Since it first aired in May 2010, “Modern Warfare,” has become a classic in the Community canon. It gives us what we love most about the show: absurdity, clever pop culture references, and a scenario taken to its logical extreme. Some of the most satisfying elements for media-savvy viewers are the action-movie tropes and references. At one point, a hostile group of roller-skating disco-lovers encircles the study group, and everyone opens fire. Jeff moves to take out one of the wheeled assassins, but finds his gun out of paint. Just in the nick of time, Britta slides in under his legs, her guns blazing, saving Jeff. It could be a moment out of Goldeneye or Tomb Raider. Another scene features a J.J. Abrams-esque lens flare, and the battle’s finale involves an epic appropriation of John Woo’s Hard Boiled, with our favorite Asian, Spanish teacher – Señor Chang (Ken Jeong) – taking on the persona of Tony Leung. Another excellent element of the episode is the costume design during the warfare sequences, as much of the cast is decked out in DIY battle gear. Troy (Donald Glover) sports a set of football shoulder pads and wears a jock strap over his jeans. Abed has on a cammo shirt, steam-punk goggles, and a paintball cartridge belt across his chest. Perhaps the funniest, though, is the armor worn by the anonymous chess club nerds. They’ve fashioned helmets out of serving bowls, gluing chess pieces to the top like spikes, and turned chess boards into breast plates. Not exactly the ultimate in paintball gear. Even with all the satisfying details in “Modern Warfare,” however, some of the scenes between Jeff and Britta come across as clunky. Their incessant arguing is not just annoying to the study group, but starts to get tiring for the audience as the writers force this plot point along. The chemistry between Gillian Jacobs and Joel McHale is weak, and Jacobs gives a wooden performance during the Indiana Jones inspired moment when Britta dresses Jeff’s wounds. Romantic plotlines, it turns out, are not something the show does well throughout its initial 5-season run on NBC. In each generation a slayer is born. One girl in all the world, the chosen one, with the strength and skill to hunt the vampire. You’re in the Hellmouth now. Come on down, the water is warm. Wait. What water? Buffy the Vampire Slayer, cancelled from the WB in 2003, reached t.v. cult status, gathering millions of fans and creating series spin offs, video games and merchandising. Despite airing back when cell phones still had pull out antennas, the show remains smart and funny, with snappy dialogue and good FX. If you have a daughter, make some popcorn and turn on Netflix. The show is full of strong, empowering messages for angst ridden teenagers. Especially female teenagers. Buffy has it all: she’s gorgeous, in killer shape, and can spot a bad guy and kick his teeth out before you can say, “That library gives me the wiggins.” Buffy the Vampire Slayer is entertaining, but has a feminist message. There are college classes still taught in psychology, sociology and women’s studies that use the series as an academic teaching tool. While getting a PhD in Buffy Studies may not help you find a job, it would definitely school you in the fine art of strong women, who suffer loss and heartbreak, but still manage to save the world. As if Buffy as a character wasn’t enough, there’s the Scooby Gang. Originally including a librarian as supernatural supervisor and two low-caste high school kids, Willow and Xander, the group was joined over the years by other intriguing characters who excelled in the art of monster-whomping. Willow and Xander suffer through the changes growing up brings, while supporting Buffy in her quest to kill vampires and other assorted demonic bad guys. Over the years the Scooby Gang reminded us that the coolest kids in high school aren’t necessarily the most popular, a lesson every thirteen year old should hear. For adults this show may be a guilty pleasure, fun to watch, but with a redeeming social message. If you named your first born Xander, then you already know what I’m talking about. This gang of underdogs battled some of the same real-life issues that haunt high school. Over the years we watched them graduate, lose their virginity and get jobs. Just like your life, but with better dialogue. Oh, and blood sucking monsters. The one constant in Buffy is the endless parade of monsters, including vampires. Lots of vampires. While these vampires look appealing at first, they’re inhabited by demons that morph out when stressed, just like teenage acne. What do we do with acne? We kill it. ASAP. This series always ends on a high note, despite death and loves lost. True to form, the show finally ended with the monsters vanquished and Hellmouth closed. Buffy, so haunted by her supernatural inheritance, is finally free to live a full, battle-free life. The ending messages of the series ring with the power of love and perseverance against hardship. Well played, Buff, well played.